‘You don’t know the power of The Dark Side’ wheezed Darth Vader back in The Empire Strikes Back, but thanks to the latest Rogue One trailer it looks like we’ll finally see just how strong the Empire truly was. The latest trailer from LucasFilm promises what looks to be a Star Wars film like none before, the Jedi are gone and the fate of the Galaxy, and The Rebellion, lies in wastrels and criminals while The Empire dominates the galaxy. The power of the Galactic Empire is clear, they’ve got tanks, Star Destroyers and Storm Troopers while the Rebels have got a rag tag bunch of no-marks. From the moment the short teaser opens with the slow orchestral music of the Imperial March you can tell that director Gareth Edwards is doing something a little different, and it becomes clear as the trailer goes on that this film intends on putting the ‘war’ in Star Wars. Honestly, prior knowledge aside, it doesn’t look like The Rebels stand a chance. But this being Star Wars means that there’s always hope, and that comes in the form of Felicity Jones as Jyn Erso and her plucky squad of rebels who aren’t going to let the sparks of rebellion die out. There’s a particularly beautiful moment in the trailer when the Imperial March dies away and the iconic Star Wars theme kicks in, a pretty on the nose way of letting us know that all isn’t lost. 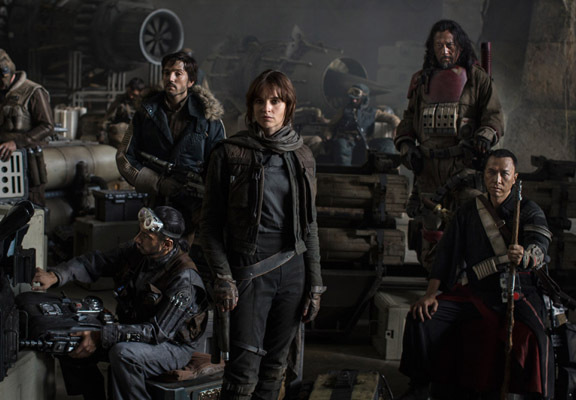 Rogue One will star Felicity Jones, Diego Luna, Riz Ahmed, Ben Mendelsohn, Jiang Wen, Donnie Yen, Forest Whitaker and Mads Mikkelsen along with many others and looks to be a Star Wars film unlike any before. Of course the gloved hand of the marketing mastermind Mickey Mouse can be see right at the end of the trailer, when they introduce the franchises most enduring mascot Darth Vader just to reassure you that ‘yes, this is a Star Wars film’. Rogue One will be released on December 16, 2016.